Get your style in check for the Spring season with the latest fancy dress shirts from Daniel Ellissa. Daniel Ellissa will never let you down with their Italian designed collection of fancy french cuff dress shirts and tie sets. 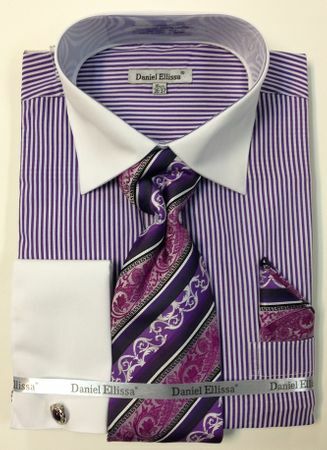 This purple oxford stripe dress shirt features contrasting white french cuffs and a white spread collar and comes with the matching tie set as shown. Made of Cotton/Poly blend fabric.